Make Your Own NintendoDS Games And Save! | OhGizmo! Make Your Own NintendoDS Games And Save! When I think about it, I spend more time playing with the NintendoDS than all the other consoles in my apartment. (As is evident by the newly discovered crack in one of the hinges.) I think it’s mostly because it’s the easiest system to just pick up and play, so I’m fairly intrigued by this piece of software called XtenDS which allows anyone to design their own ‘homebrew’ game thanks to an easy to use GUI interface. 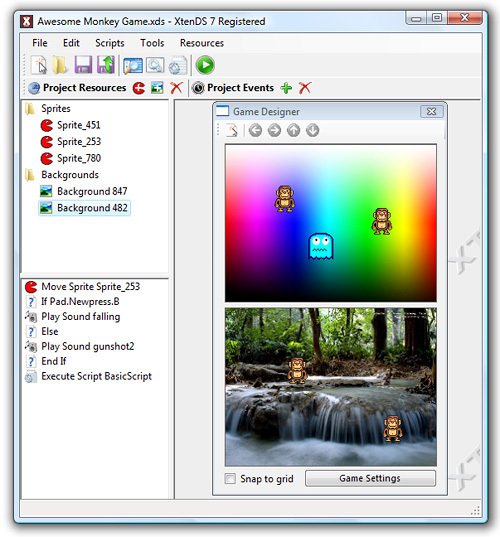 The software includes support for sound effects, music, sprites, backgrounds, menu and option screens and even has more advanced functionality like a fully working collision system and an advanced scripting language. Just keep in mind you’ll need to have a homebrew cart like the CycloDS in order to load your creations onto your DS. (Or an emulator on your PC.) And there’s a good chance if you already have one of these carts, you’ve probably already found a way to get cheap games. But if you’ve had an idea brewing in the back of your head for the next great DS title, but lack the necessary programming skills to bring it to fruition, XtenDS could help make it a reality.